APH has a long history of collaborating with commercial electronics manufacturers to adapt their consumer products for our more specialized market. It should come as no surprise that developing electronics from scratch is an expensive and time consuming enterprise. By adapting already popular consumer models, our technical research folks cut years off the time it might take to bring a product to market. For a modern example of this, see the Orion TI-84 Talking Graphing Calculator. APH introduced its second (and last) reel-to-reel tape player-recorder around 1969, a modified version of the Sony 105. It came in both a standard speed and a variable speed version (we have both in our collection but this example is the standard speed version). The modifications were fairly simple. The small red button beside the record button in the lower right allowed a user to add an index tone to the recording—so a particular passage could be located again quickly. 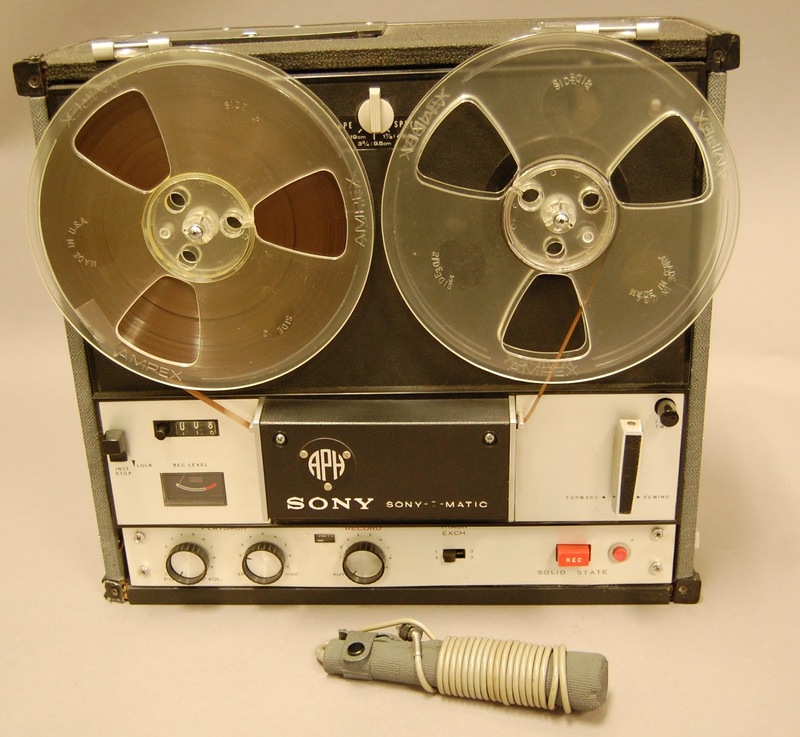 The reels were self threading, and tape lifter arms that prevented playback on the commercial model during rewind or advance were removed, so the user could quickly scan through material. APH sold 5,627 of the standard speed version and 7,919 of the variable speed version before discontinuing them in 1980. By then, APH had introduced its popular line of adapted G.E. cassette tape player-recorders. For a time, APH also issued educational programs recorded on reel-to-reel tapes. The REAL Program (Recorded Educational Aids to Learning) ran from 1955-1977.